Today I am celebrating the second anniversary of my blog, which I started as a response to unemployment. A big thank you to all you readers and especially my followers who continue to inspire me. So much has happened since then. I was soon employed and am now able to go on holidays and have driving lessons. Driving is still scaring me but apparently I have good handling of the car. Speeding is my main problem, as everyone else does so I feel like I am holding them up, but it is also quite fun. However I am aware that having points on a provisional licence would not be ideal. My instructor is right to eye that “speedo” like a hawk. The amount of time I spend waiting for buses alone may justify the expense of a car. In today’s fast-paced society, time is money. I’m also saving for a house but the deposit alone is £60,000 so even though I am responsible for half, it’s going to take me years if not decades. But I digress. 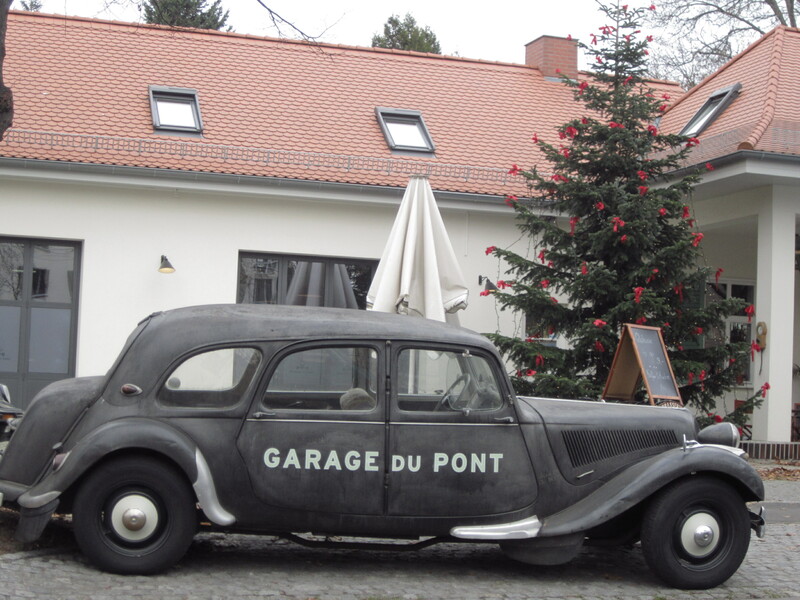 As promised here is Potsdam in December. We went on a walking tour which wasn’t worth the money but it’s a lovely city. 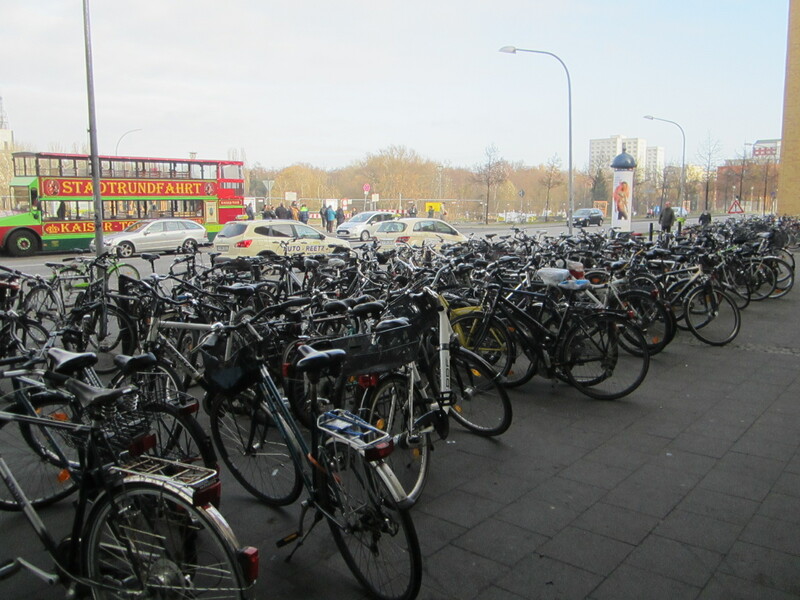 The Germans are almost as excited about cycling as the Dutch. Bahnhof is German for station. 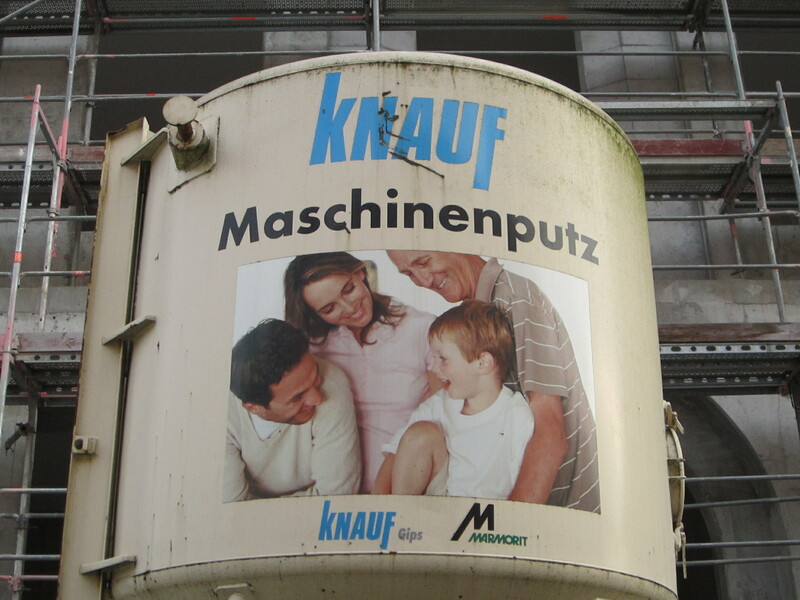 Building work is transformed into art and a cement mixer features a family for no apparent reason. 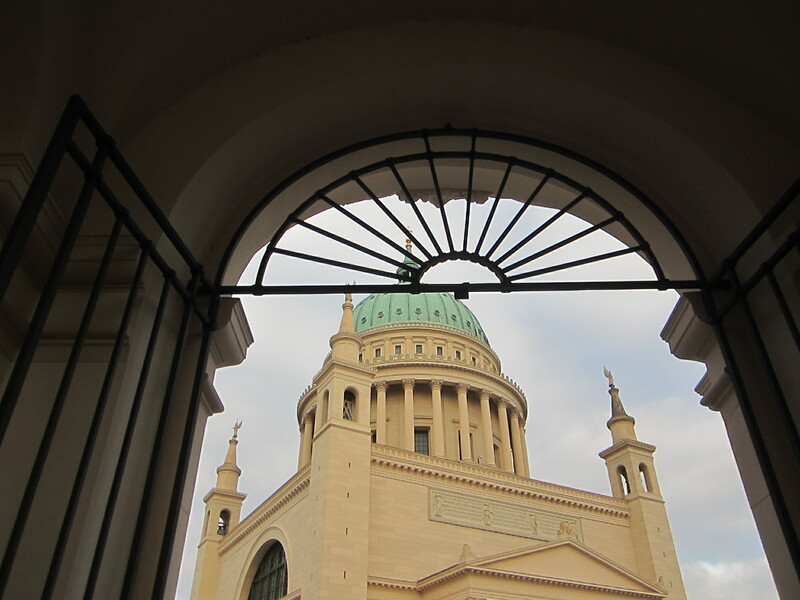 A church seen from the palace (reconstructed due to extensive bombing in the Second World War). 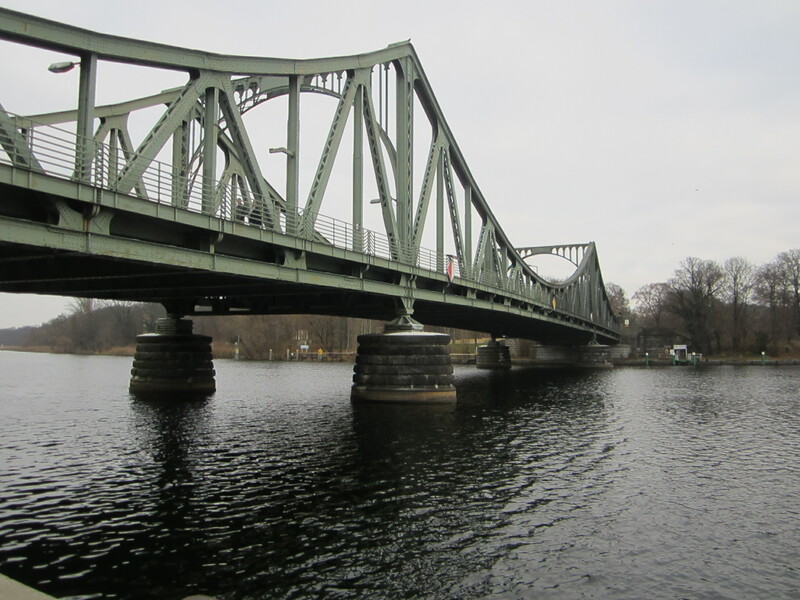 Glienicke bridge where three spy exchanges happened between East and West Berlin from 1962-86. 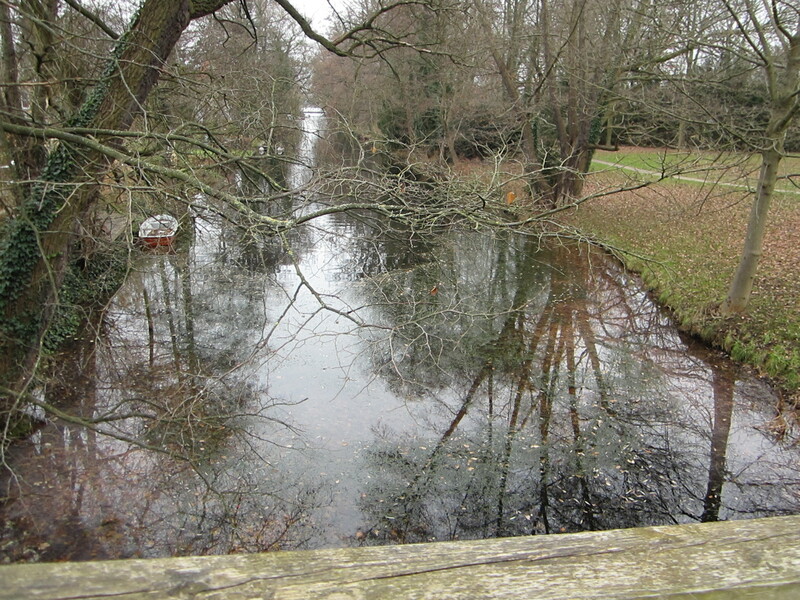 One of Potsdam’s many parks. People used to try to swim across to West Berlin from here in the Cold War days. 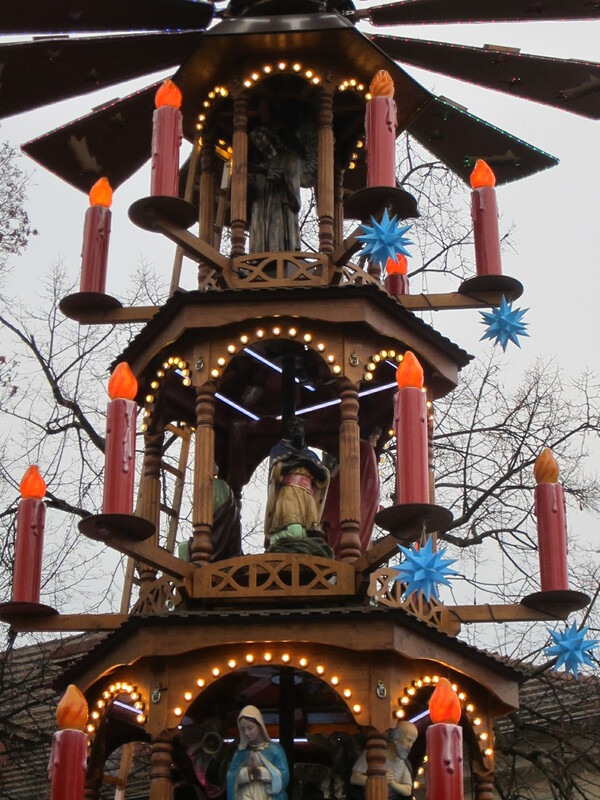 The Christmas market here looked more authentic and less touristy than Berlin’s. December was a busy month with trips to Birmingham, Berlin, Lancaster, Norwich and Great Yarmouth and a visit from my cousins, where I cooked for five for the first time. I learnt that you need to have everything prepared and ready to go for the day of the visit. I spent that morning scouring local farms for turkey, only to be told that it had to be ordered in advance. I was saved by a pre-prepared one at Waitrose. 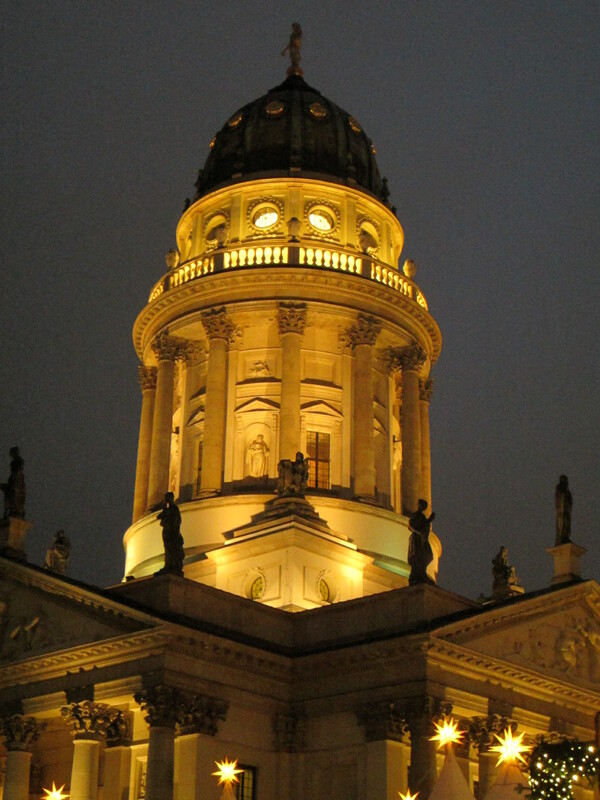 There was so much to see and do in Berlin. 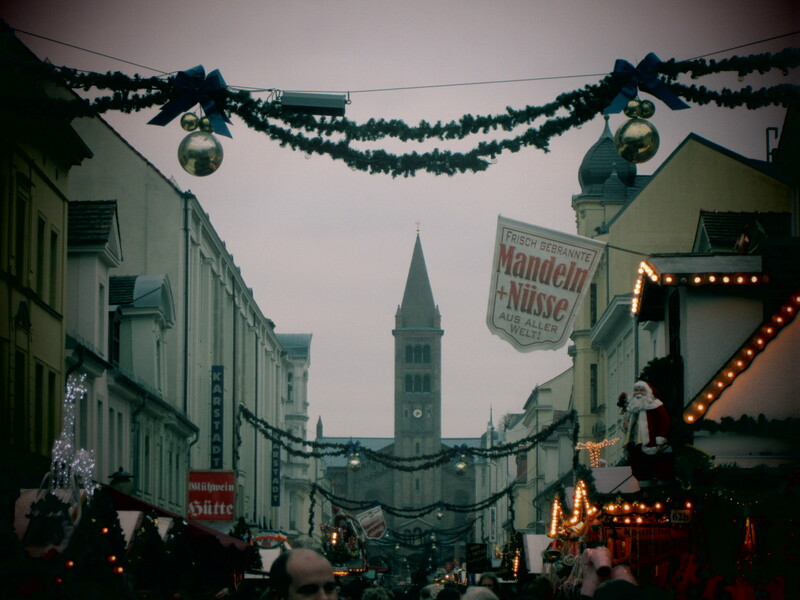 The city had a festive atmosphere with Christmas lights and markets. Temperatures were close to zero so my thermals came in handy. Hotel Indigo was comfortable, clean and stylish and was lovely to return to after a day on our feet. We had an executive room with a balcony and we wrapped up to admire the view. 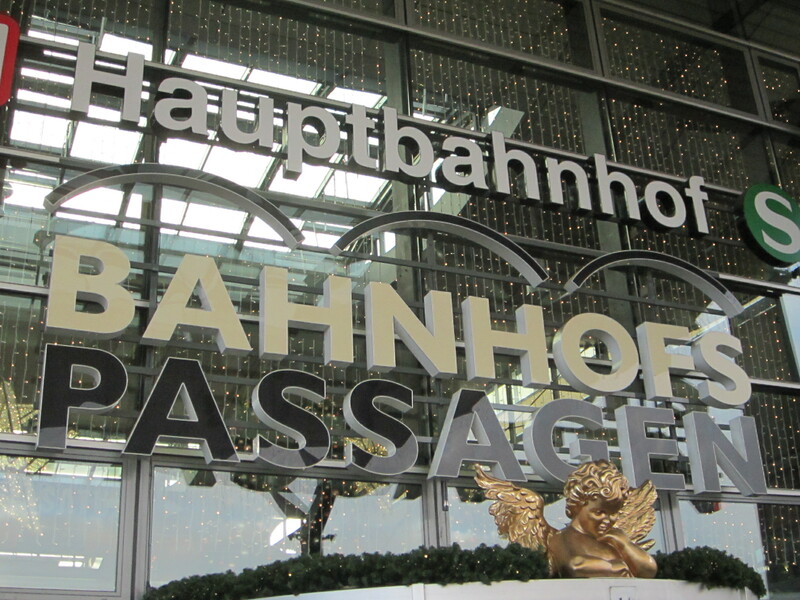 It was easy to get around using the S-Bahn and U-Bahn train systems. The U-Bahn is the Underground. You have to get your ticket stamped by the machine or you can be fined. Transport links from Schönefeld airport were dismal, perhaps the reason for its rating on Google of under 3 stars. We were shattered after our budget airline experience featuring the usual lengthy queues. 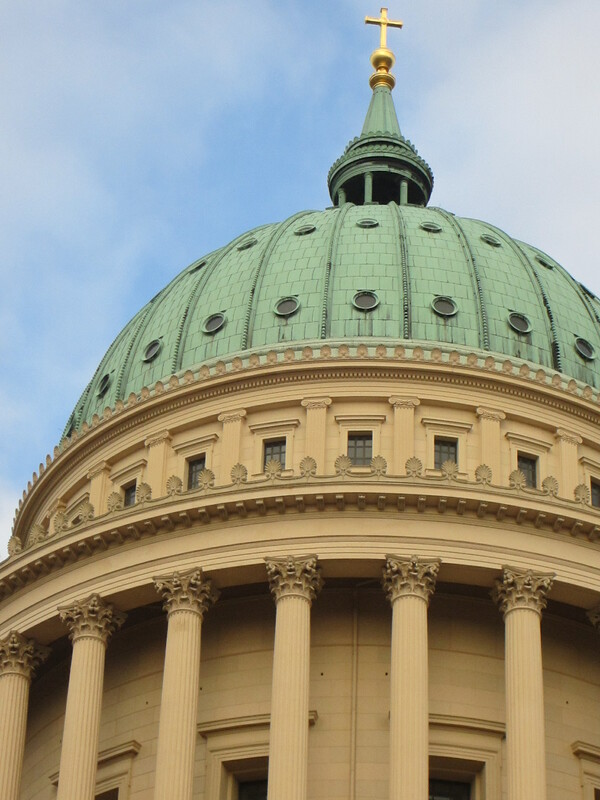 I nearly fell over as I had labyrinthitis – an inner-ear infection causing balance issues and disorientation. I had just started swimming again and medical opinion was that it had pushed infection further into my ear. Luckily it was the last 24 hours of it. There was a long walk to the train station which was a vast concrete space with confusing German signposting to unfamiliar areas and some omnipotent machines. You needed to have the right amount of coins as they did not take cards and most did not like notes. Perhaps this is to encourage those in the know to buy at the airport. There were no officials and no information desk. In England there are information points at almost every major station so it was a culture-shock. I’d already been jarred by the lack of warm water in public toilets. Economical efficiency at its best but punishing in winter. Hand-warmers are recommended. 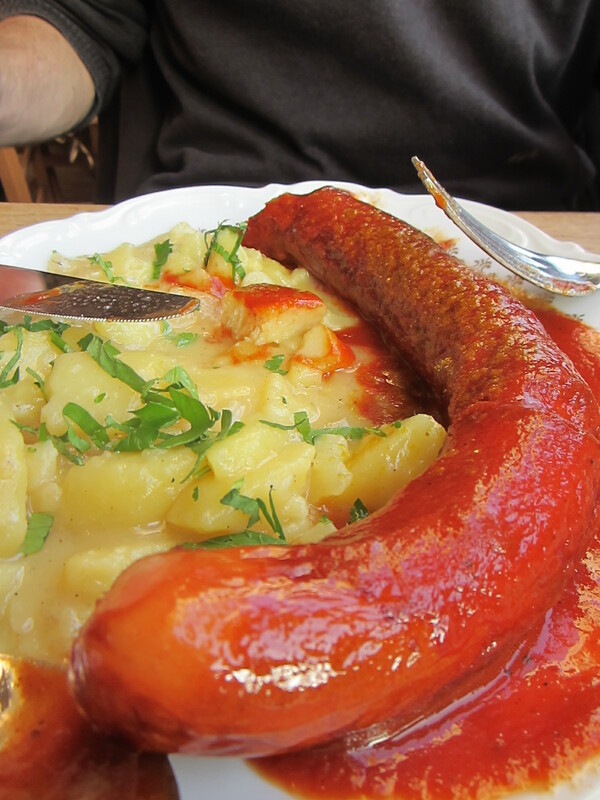 Many meals centred around sausages (wurst). This is tasty currywurst. 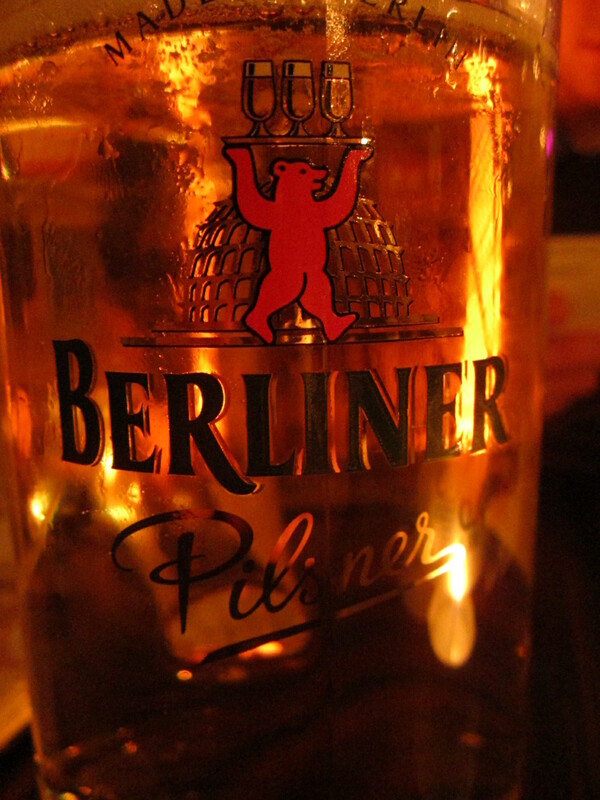 This pint features the German bear in front of the dome of Berlin’s parliament or Bundestag which is one of the subjects of my next post. Bears first appeared on a city seal (emblem) in 1280. The earliest city seal from 1253 didn’t feature a bear but an eagle, which was the symbol of the Margraviate of Brandenburg, an important part of the Holy Roman Empire that included Berlin. In 1280 the second emblem featured a Brandenburg eagle flanked by two standing bears. When Cölln and Berlin were merged into one city in 1709, the coat of arms featured the bear below two eagles -red for Brandenburg and black for Prussia. 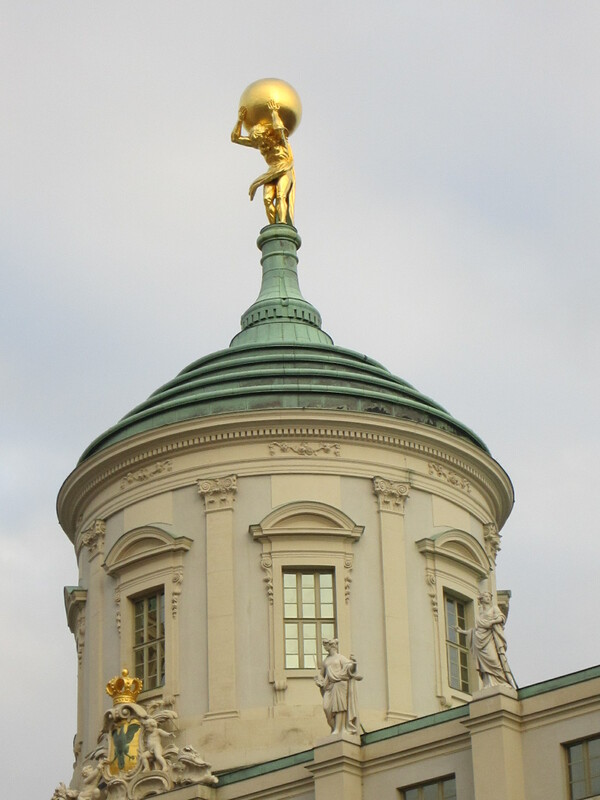 By 1875, the bear gained a crown signifying Berlin’s status as a free city. 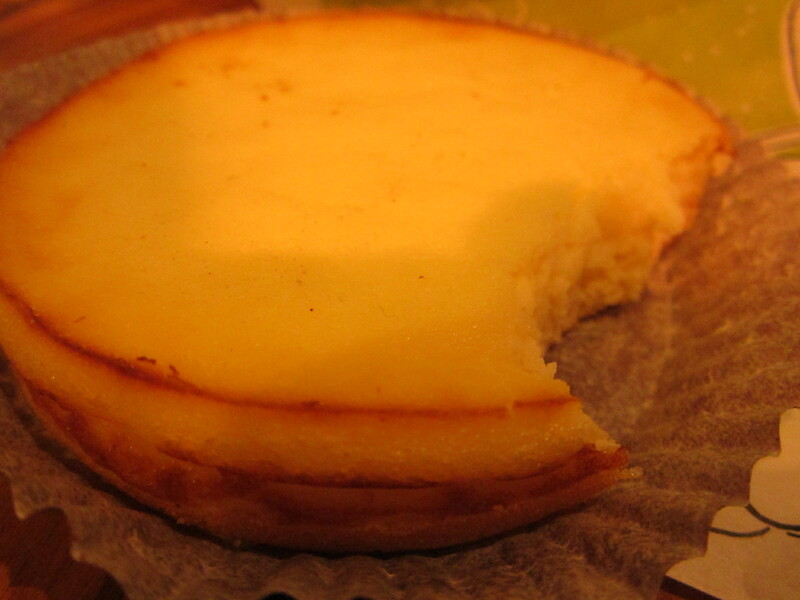 The apple cake was delicious. 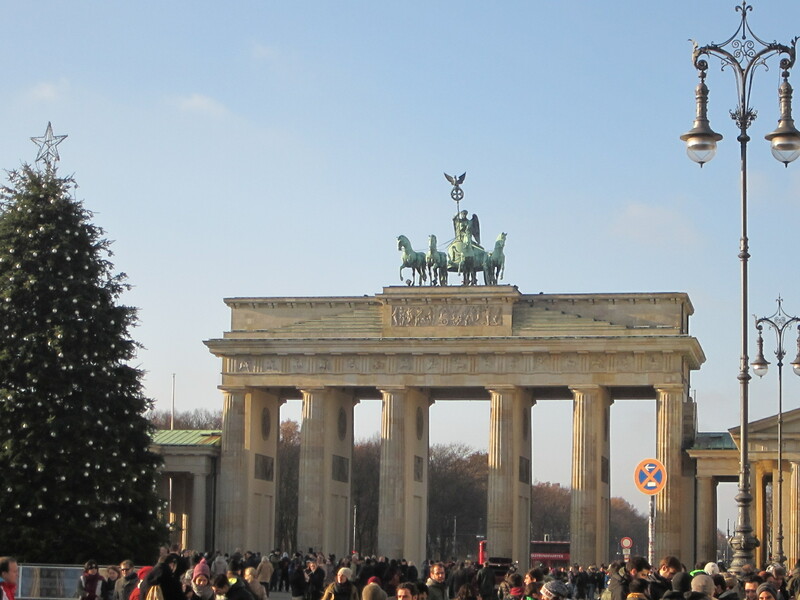 Our walking tour started in front of the Brandenburg Gate, outside Starbucks. It was free if you were heartless but our charismatic guide explained that he lived on donations and 15 Euros was the going rate. It was well worth it as we felt we had seen all the key sights and were fully briefed in the history. All questions were answered. Just past the Gate on the road is the dividing line of the Wall that divided East and West Berlin until 1989, stretching off into the traffic. Division seems a distant memory, one that many would surely rather forget. Today is the 70th anniversary of the Soviet liberation of Auschwitz where over 1 million people died. An estimated 90 per cent of these victims were Jews, with Poles, Romani gypsies, Soviet Prisoners, homosexuals and others deemed “undesirable” making up the hundreds of thousands of non-Jewish victims that were killed at the hands of the Nazis. The death toll is inconceivable. I thought of my grandfather, who liberated and dealt with the aftermath of Bergen-Belsen. Hell on earth. He never spoke of it and it must have been easier to repress than think about. Primo Levi, an Italian Jewish Auschwitz survivor, writer and chemist, remarked “I am constantly amazed by man’s inhumanity to man” quoting the Robert Burns poem “Man Was Made to Mourn”. 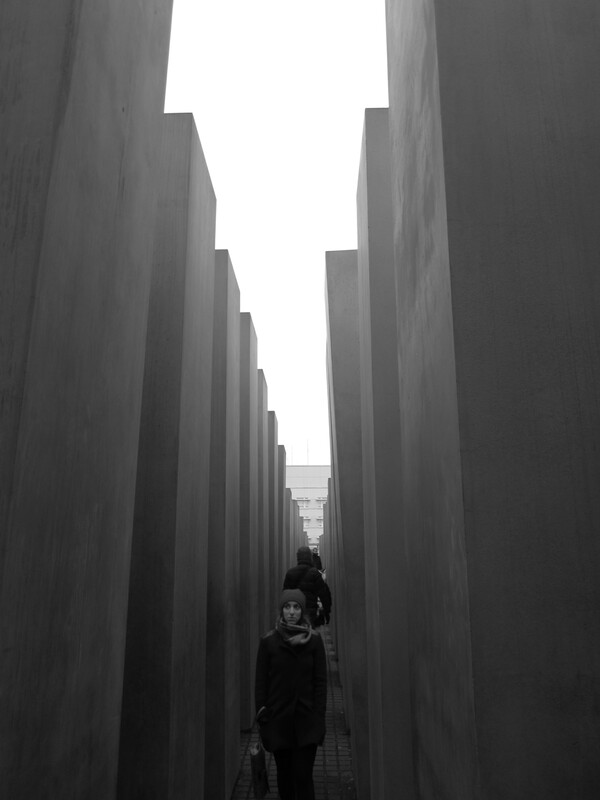 The Jewish Memorial in Berlin was quite an experience. It was a series of concrete blocks gradually getting taller until you were engulfed by oppressive blank columns trapping you on all sides. You are suddenly in a narrow space overshadowed by heavy grey monoliths leaning towards you which blocked out the light. It was even more powerful at night. I couldn’t see anything but a gloomy, shadowy passage in front of me. It was eerily silent and you could hardly see the sky. 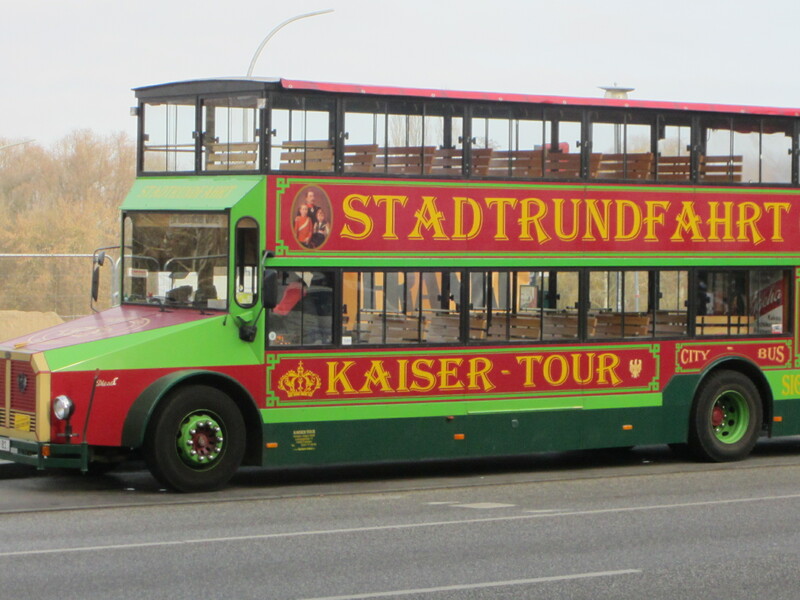 You could go on a “Trabi” tour. Trabant cars, affectionately termed “trabis”, were iconic vehicles used by the Soviets of East Berlin. 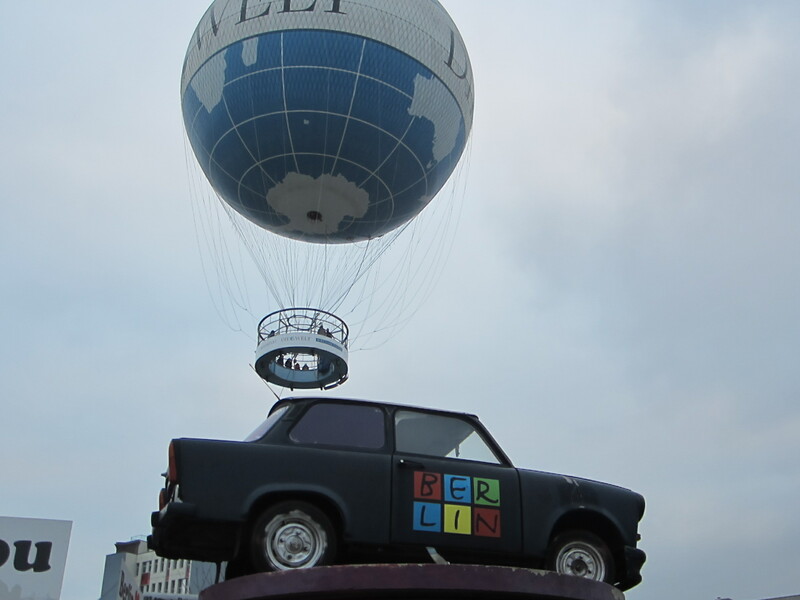 There is a museum for almost everything in Berlin, from those cars to computer science. Balloon sightseeing looked fun but freezing. 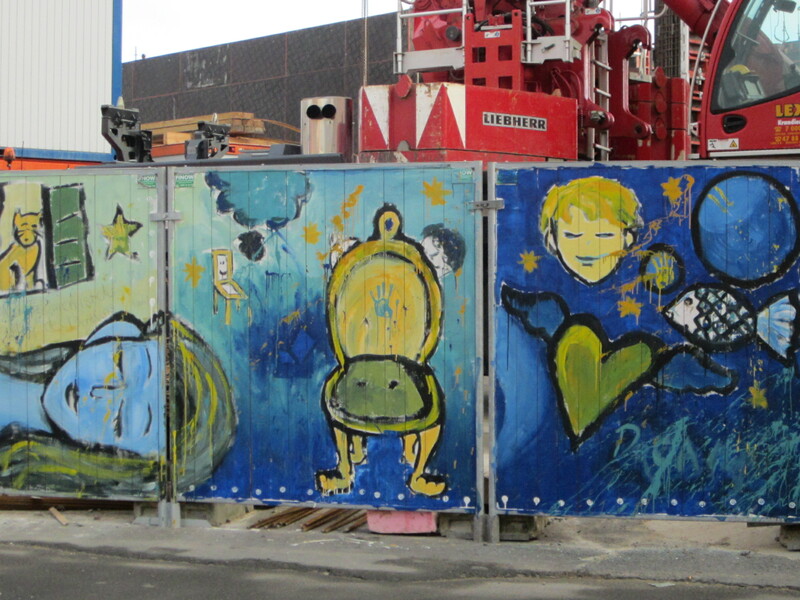 We didn’t get a chance to see the Berlin Wall art but click here for a good website with it. The East side still retained some differences such as the pedestrian crossing signs which featured a large man in a hat. The design was conceived by a traffic psychologist, Karl Peglau. The thinking behind it was that we react more quickly to appealing symbols. The history of a divided East/West Berlin reminded me of North/South Korea. The Russians called the East the Federal Republic and the British, French and Americans named the West the Democratic Republic. The wishful thinking post-War was that both halves would be run harmoniously. But the 1950s saw the fear of Communism explode in the States with witch hunts including even Charlie Chaplin. There were uprisings in the East which were dealt with by the Stasi, the secret police. Around 2.7 million East Berliners defected from 1949 until the Wall was built, with 200,000 leaving the year before in 1960. Reasons for escape were economic, social or political.One reason was the introduction of a collectivization policy in the 1950s. The goal was to consolidate individual land and labour into collective farms in order to increase food supply. But this meant that profits decreased and there were food shortages and riots instead. also to stop the East-West exodus. 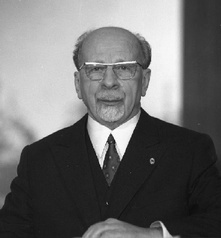 The East-German leader Walter Ubricht termed it an “Anti-Fascist Protective Rampart” protecting the Federal Republic from “military adventurers”. 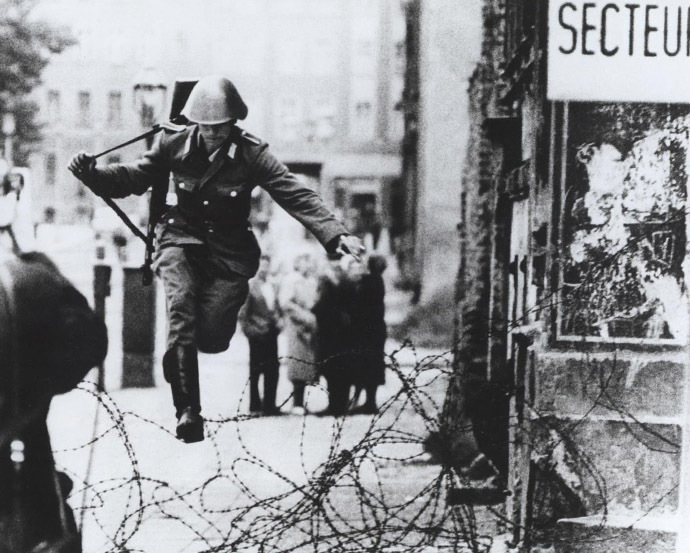 The photo above shows border guard Conrad Schumann who left two days after Wall construction began. His fellow soldiers were distracted and he saw his chance. West Berliners encouraged him to jump and after deciding for a moment he went for it. The moment was captured by passing photographer Peter Liebing. The iconic photograph was used as propaganda. There were some unusual escapes, such as by tightrope-walking and with a car converted to go under the crossing barrier. Many who succeeded were guards, with over 1,300 fleeing in the first two years of the Wall’s construction. This led to the installation of locks and further walls requiring several soldiers to open them. 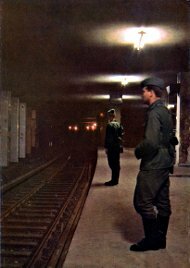 There was a good exhibition at Nordbahnhof S- Bahn station about the division of the Underground. Tube trains from the West could pass through Eastern stops but they could not be used and became “ghost” stations. Even here soldiers escaped, so they would be locked in a platform bunker until the end of their shift. Officially, 136 Berliners died fleeing to the West. Some wanted to earn more money, others were trying to join family members. Friedrichstraße station was nicknamed “The Palace of Tears” as it was the station where East Berliners would have tearful goodbyes to West Berliners returning, unsure when they would be allowed to see them again. Many casualties were not recorded by the secretive Soviets. But a victims research group called “August 13 Working Group” has claimed there were more than 1,100 fatalities linked to the division of states. West Berliners used it to fly-tip. The photo above captures the worst Wall stand-off caused by a senior U.S. diplomat, Lightner Jr (American for Junior, which means son of) wanting to go to the opera in East Berlin. 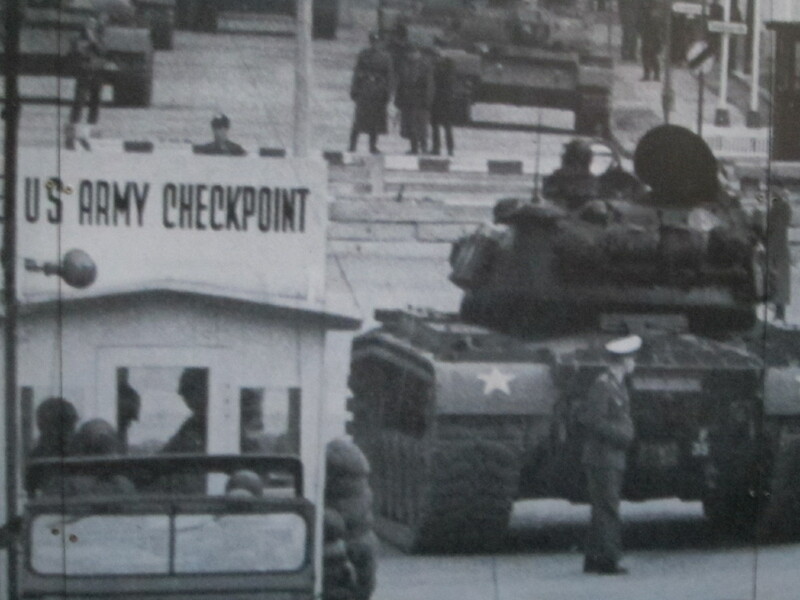 The East Germans demanded to see his passport, which he insisted only Soviet officials had the right to check. He was forced to turn back. Due to the tank stand-off and fervent diplomacy that ensued, officials on both sides were allowed to attend the theatre and the opera over the border. As for Lightner Jr, he went to the performance days later. This month Stasi records became available online for the first time. The Stasi were Soviet secret police. Their files have been available to their subjects since 1992. But you had to write out for them and there were delays in release. The records were saved by East German citizens who stormed Stasi offices when the Wall fell in 1989. They include the harrowing case of Manfred Smolka, a former East German border guard who was seized, thrown in solitary confinement and guillotined after he escaped to the West. 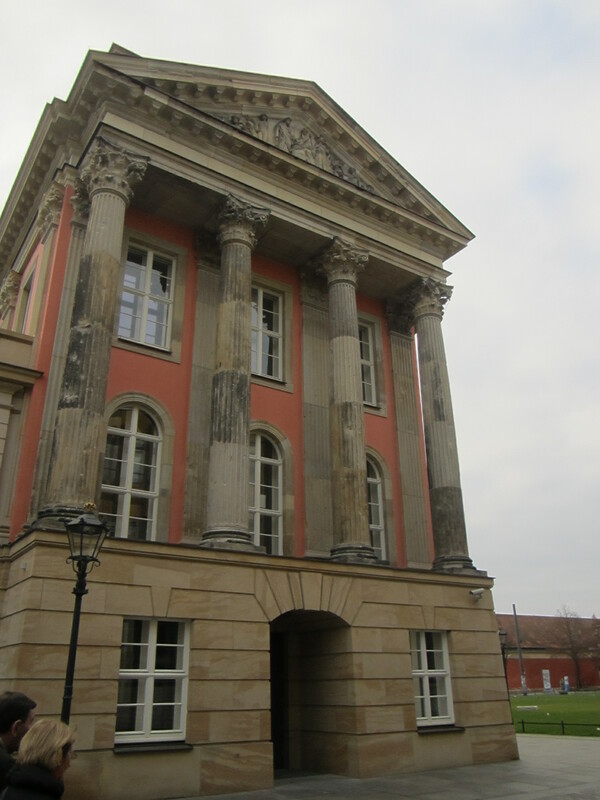 The Stasi even attempted to recruit Prime Minister Angela Merkel when she was at University. Our tour guide was fantastic and we felt like we had been fully briefed on the key history and sights of the city centre. 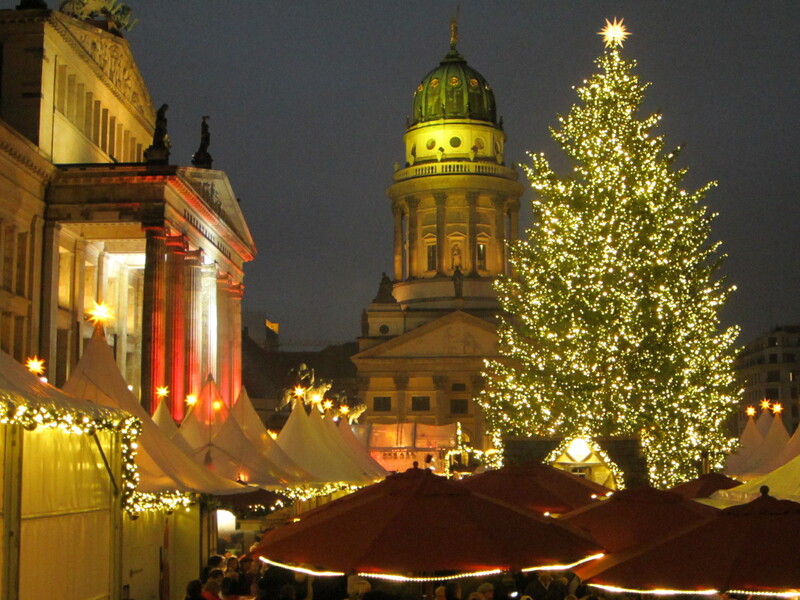 The German market looked fantastic. To the left is the Concert House where we enjoyed an orchestral and choral Bach performance. All photos on this page Copyright literarylydi. Please ask for permission before using. Thank you. 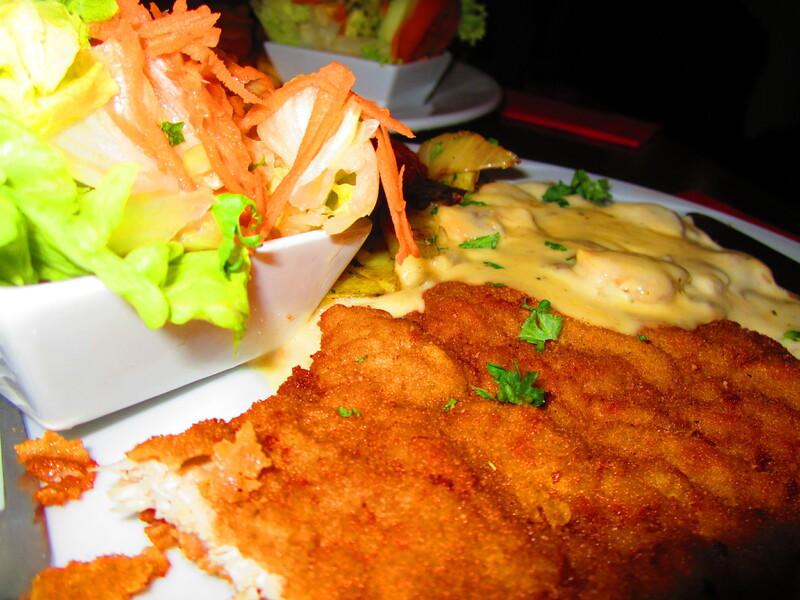 You must visit Fassbender and Rauch. It’s a chocolate shop with green awnings like Harrods and has confectionary which is just as fancy. 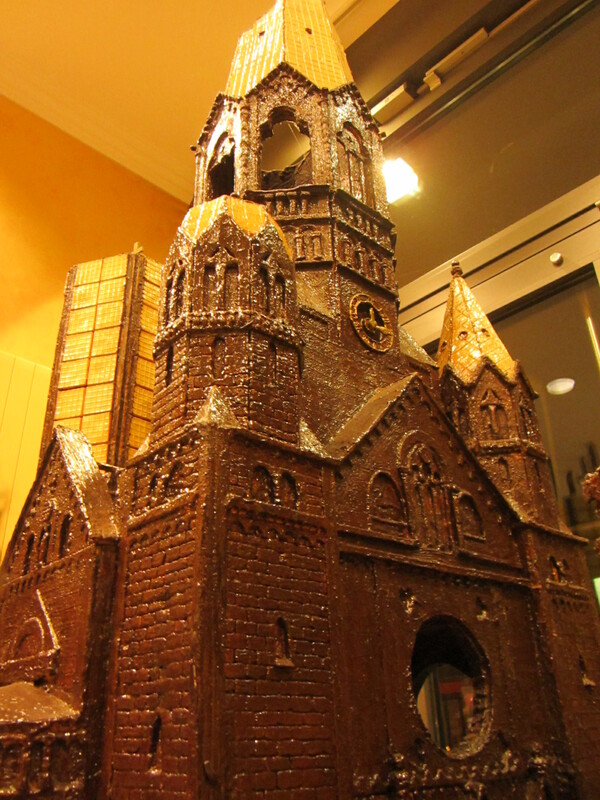 There were several iconic buildings made entirely of chocolate. 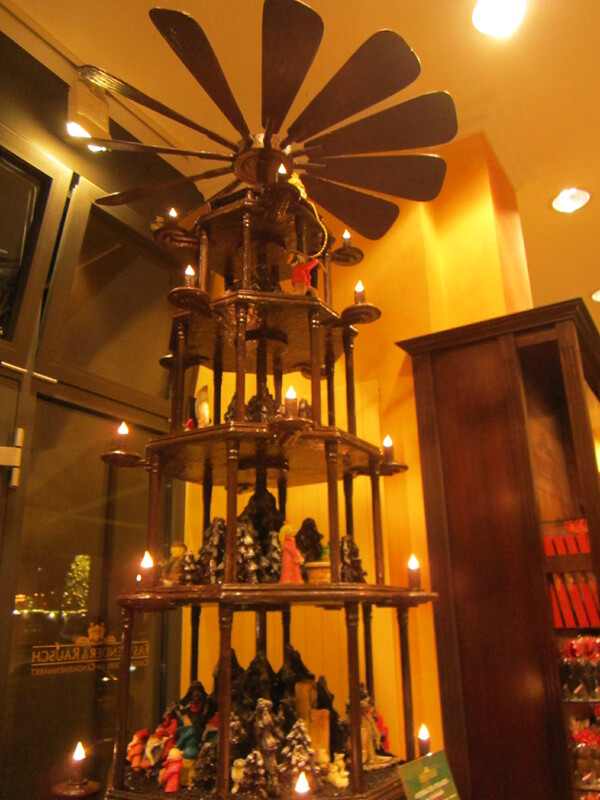 Upstairs in the lift is the restaurant where they do a main meal in chocolate on Monday-Friday. There can be a queue early in the afternoon but it is worth the wait. Their petit-fours look exquisite and are delicious. 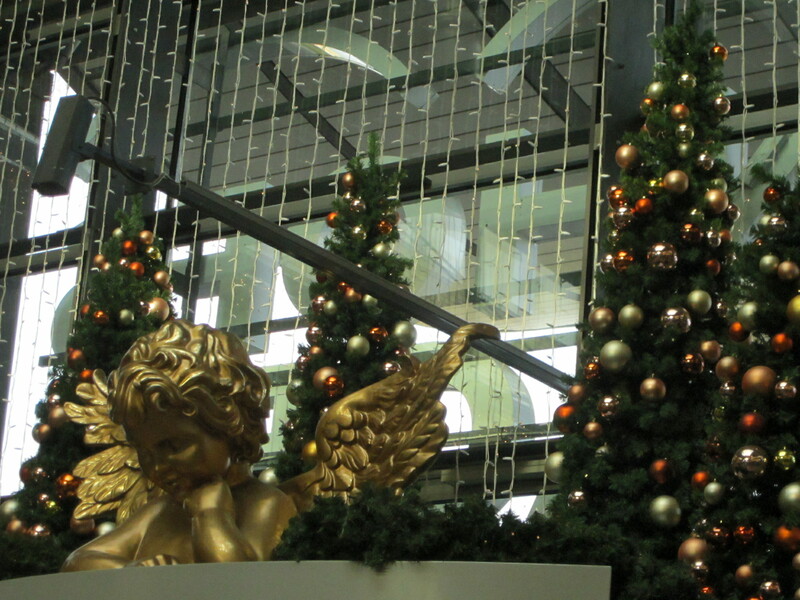 Christmas decoration in Pottsdam, copied nicely in chocolate in Berlin. That city is the subject of my next post, along with more of Berlin.